Gold forecasts Gold technical analysis today using the technique of the Economist and American trader W.D. Gann. The descending angular resistances from the historical top of September 2011 and October 2012 has blocked the bullish acceleration of Gold in September and December 2017. From the first days of January 2017 until the first days of 2018, the yellow metal prices have reached the maximum relative to the first positive impulse of July 2016 in area 1,350​​$, albeit with many difficulties. The 1 X 2 angular resistances (yellow colored in the slide) mentioned at the beginning at first were broken to the upside, then they offered a magnetic field on trades, turning the Gold positive directionality of January 2018 in a distribution phase that has ended last May, period of monthly Set Up. The continuation in June of negative directionality has pushed metal prices up to 1,159.96$ in August, where the subsequent dynamic support was present. 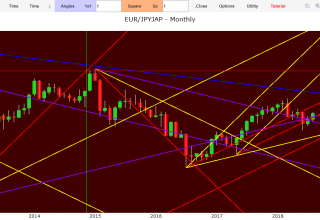 The time cycle expired in October 2018 with the reverse of the swing chart has determined a trend inversion that will have to be confirmed by the expiry of the next Set Up in December 2018. The continuation above 1,253$ level will confirm the positivity in progress of Gold in the medium term: first resistance 1,280-88$. The return of exchanges below 1,173$ will restore a new negativity in the medium term. The 1 X 2 angular support together with the octave static support are blocking the corrective dynamics started in the second quarter of 2018. If Gold prices are able to reach a level above 1,275$, then the long term will also reverse the trend in positive. First angular resistances in area 1,316$. Conversely, the prices exchange below 1,149$ will confirm the current negative directionality. Supports at 1,177-1,155$. Gold technical analysis is illustrated with the support of free exchange software Top Trader©.